It was during the course of the eighteenth and nineteenth centuries that the problem of chronic alcohol dependence in modern society and its consequent medical effects emerged. The topic of drunkenness figures prominently in the thinking and writing of social reformers, politicians, theorists, medical practitioners, and psychiatrists. Eventually, by the mid-nineteenth century, ‘alcoholism’ was named as the disease of habitual drunkenness. Possibly the most important book to predict this was Trotter’s Essay, written in 1804. Through case studies based on wide experience, he detailed the manifestations of alcoholism, ventured therapeutic recommendations, and squarely termed drunkenness a disease – indeed, a mental disease. Originally published in 1988 as part of the Tavistock Classics in the History of Psychiatry series, Roy Porter’s Introduction to this facsimile reprint locates Trotter’s work within the wider history of the evolution of the idea of alcoholism. It also examines the Essay in the context of Trotter’s own life and mind – a mind preoccupied with what he saw as the degenerative tendencies of modern civilization and with the wider issues of drug dependence. Preface. Introduction by Roy Porter. 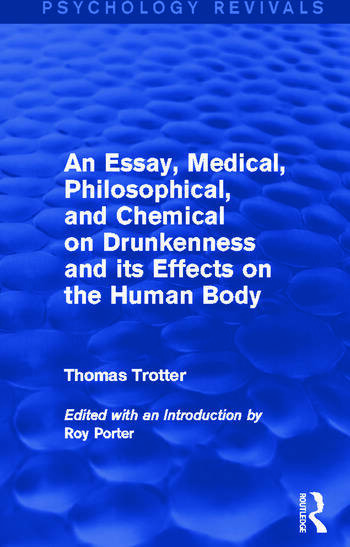 An Essay, Medical, Philosophical, and Chemical, on Drunkenness and its Effects on the Human Body by Thomas Trotter.